The lady pictured with terrifying Jim Henson Creature Workshop creation/popular talk show host Rush Limbaugh up there is Kathryn "Kate" Rogers. Oh, look at that, she's got a ring! 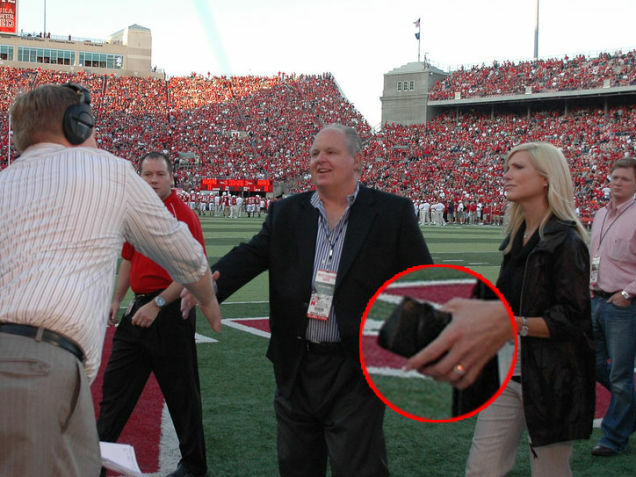 Congrats to Rush Limbaugh, for popping the question to this woman (according to what she's been hinting to friends!) who surely loves him for his winning personality (which is the same reason he loves her, obv). Kate, 32, is a party planner and is currently planning the Super Bowl or something. Rush divorced his last wife in 2004. Go ahead and congratulate Katie at her Facebook page!